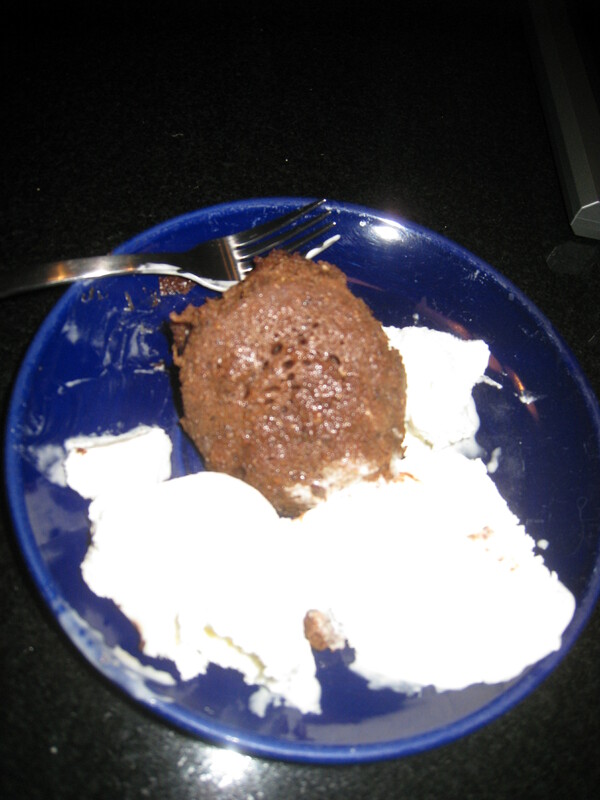 After dinner tonight, I made the simplest, most delicious dessert! Microwaved cake in a mug! Five minutes and you’ll be enjoying the chocolatey goodness! While many of my recipes are “good for you,” I’m not even going to pretend that there is anything even marginally nutritious about this one. But oh my is it good! Add dry ingredients to mug, mix well with a fork. Put mug in microwave and cook for three minutes. Cake may rise over top of mug. Tip on a plate and enjoy warm! I have had several opportunities to work with various lactation consultants over the past month. What an interesting learning experience it’s been. I look forward to continuing to learn more and more about breastfeeding mothers and babies and the hurdles and joys that they face. It was wonderful to see the consultants in action. I look forward to the day where I can include myself among their ranks. Among the consultants I have been lucky enough to work with, I have seen such a variety of techniques and mannerisms. While they are all wonderful at what they do, I definitely relate to some styles more than others. Sometimes the interaction seems almost clinical to me, friendly but serious. Other consultants will sit down beside a mother and to an outsider you may think that they had been friends for years. This particular approach is very appealing to me. At a time when a mother is feeling stressed and exhausted and hormonal, I’m sure it is very reassuring to have that “girlfriend” type figure holding your hand as you struggle to learn what is so important to you. Watching some of the women, it seems more like mother-to-mother support than a clinician-client relationship. I’ve been tossing up the idea of trying to get more organic produce into my family’s diet. It’s an idea that I’ve been playing with for about a year now but never really acted upon it. Two events have occurred recently which helped me decide that now is the time. Firstly, I was talking about the subject with my friend Sara, who is into extremely clean eating. Before having her daughter, Sara worked in the shipping industry. She told me that when a ship had a container of bananas in it’s hold, nothing combustible could be placed in adjacent containers. Bananas, she told me, were so heavily sprayed with pesticides that the containers carrying them were actually at risk of explosion! We are NEVER without bananas in our house so I cringed to think of the levels of hazardous chemicals that I am bringing into our home every week. The second incident that pushed me over the edge was watching the documentary “Food Inc” with my husband. This film outlines the differences between organic and industrial farming and it really opened my eyes to some interesting facts. Cancers, autism and neurological disorders have been linked to pesticides. The average food product travels 1500 miles to end up in my grocery store. Besides being picked before it has ripened, that food transportation also accounts for over 30,000 tons of greenhouse gas emissions every year. Animals that are raised in factory farms are usually treated inhumanely and unnaturally (cows are supposed to eat grass, not corn!) Given a choice for my family, why wouldn’t I try to serve them only the best – local and organic? 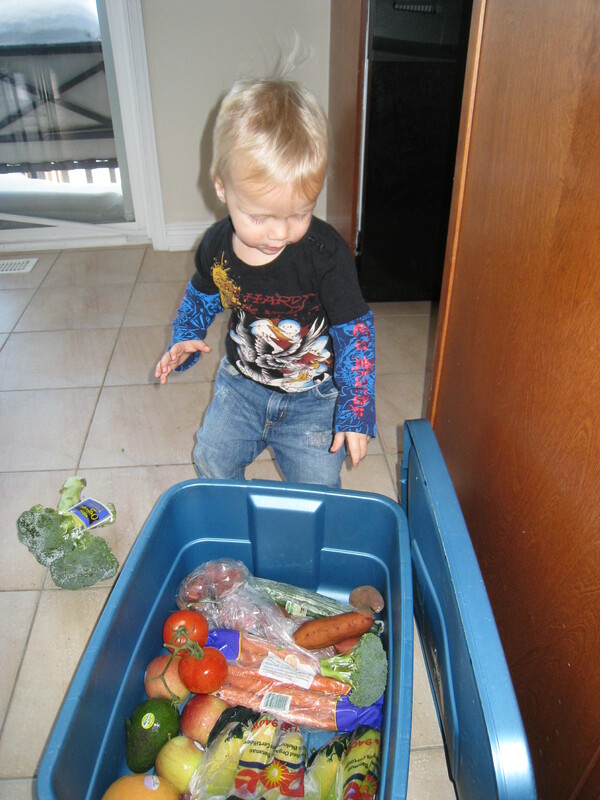 What we have decided to do is have an organic produce box delivered weekly. Based on all that I had learned, I concluded that I would sign up for the program and then evaluate if it is worth it. Life Organic delivers a box full of fresh organic produce to my doorstep for $35 dollars a week. What I really like about the program is that (where possible) the produce is local and in season. It’s nice to know that my vegetables have not travelled thousands of miles to get to my table. We are really enjoying the variety of products that are included in our box. We have always been fairly healthy eaters, but this program is really expanding our culinary horizons. I was really in a rut of cooking broccoli, carrots and peppers… and then repeating. Since receiving our box I have introduced kale, red chard and beets into our diets and we are really enjoying the departure from status quo. OK, perhaps Tristan hasn’t yet fully embraced “green things” but I have made him beet chips which he inhaled. Score one for mommy! Now that we’ve got produce covered, my next goal is find a local supplier of free range meat. Baby steps towards a healthier, more earth sustainable diet. Tristan excited by all the fresh produce. If only he'd eat more of it! You are currently browsing the A Mom Like Me blog archives for February, 2010.